I have always wanted a huge kitchen, with an island where I can stand and cook, an Aga, or a big six burner professional oven (or ovens), and a dining nook. I can see the kitchen of my heart in my mind’s eye. And it is fantabulous! Its a place to hang out, chat, eat, laugh, share. Its an extension of my cooking philosophy and my way of living – casual yet passionate, full of pleasure and joy. The reality? My kitchen is so small that if I stand in the middle of the (possibly 8 foot) square room, and hold out my arms, and slowly turn a circle, I can touch all the edges of the room – the fridge, the oven, the sink and the stove top. The kitchen is crammed with cupboards and storage, and still, there are some things (like my professional ice cream maker, or the huge cast iron pot) which just dont fit in – and therefore find space snuggling elsewhere in the apartment. Dont get me wrong, I love my kitchen. I know where everything (well, most everything) is, and I can produce some pretty phenomenal food from here. 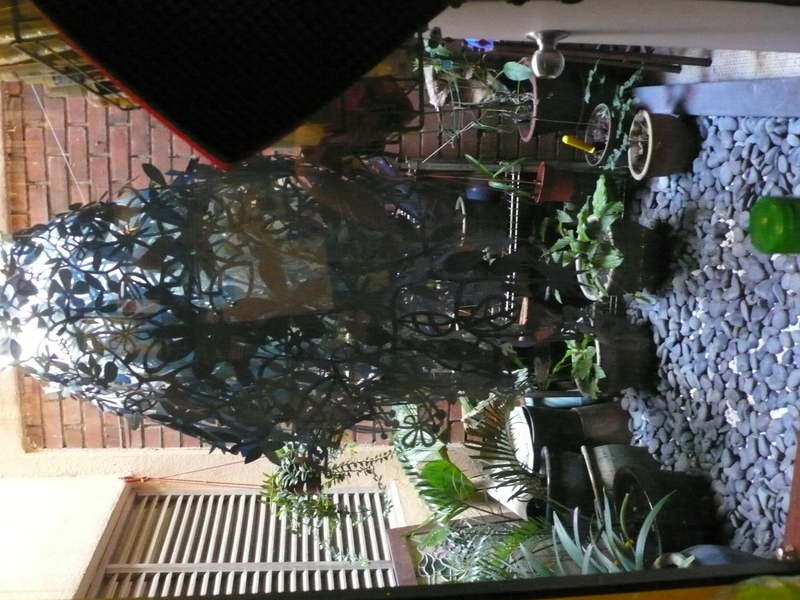 I love it for its windowed view of my garden airwell, for its compact efficiency, and for its double sink. But if you stick more than 2 people in the kitchen, no one can move! So I thought I would give you a “tour” of my kitchen, beloved, bedraggled, and slightly battered though it is, its mine, and I love it! The fridge is immediately on the left, as you walk in. 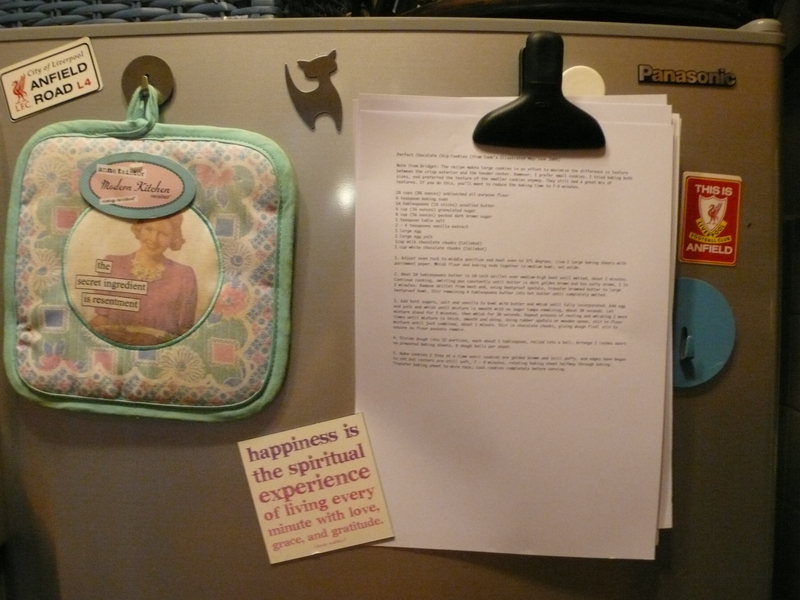 The front is covered with magnets – hooks and clips and things I love. This view shows my two favourite – a hook magnet, holding the most awesome pot holder from my sister – its by Annie Taintor and says, “Resentment is the secret ingredient” – made me laugh out loud when she gave it to me! And the second is a clip which holds whatever recipe I am working on at the moment. A useful trick for hands free checking of recipes while cooking. 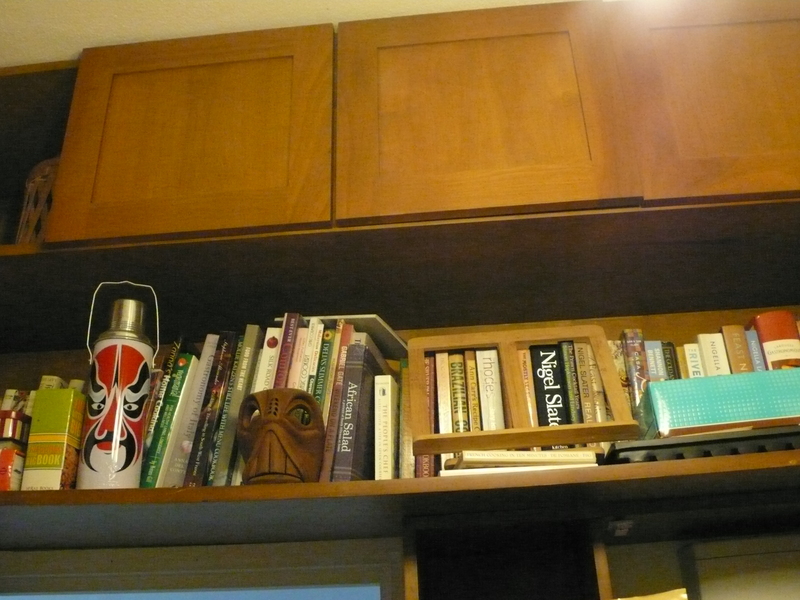 Above the fridge is the bookshelf which houses may be a third of my cookbooks (I didnt realise I had so many!) and some store cupboards for things I dont use very often. I have a step ladder to help me get up there! I love my Mah Meri Kitchen God wood mask – he protects me and ensures that everything that comes out of my kitchen is delicious! Going in a circle, after the fridge comes the oven, and then the countertop. Well, its more like a fully stuffed area where all the immediate cooking stuff is. Stand mixer, kettle, toaster. Bottles of olive oil, wine, and home made vanilla essence. My knife rack, which holds my most used work knives, not my obsessional ancient Sabatier which I collect, and take out every now and then to caress. My spice shelf – holds the usual suspects, grinding pepper, white pepper, fleur de sel, Maldon, vanilla, smoked paprika, herbs of various kinds. Its a mess, but its an organised mess, and I know where everything is! Next to the countertop is my double sink (a lifesaver!) and big windows looking out onto my airwell garden. I love this view, and my gorgeous Tord Boontjie lamp which hangs outside. This airwell is where PutPut and Kai (the cats) hang out all the time (their litter is hidden in a long wooden bench) and it gives much needed light and air to a very small space. Just to the right of the door leading to the airwell garden (and my self contained washing machine + drier – another lifesaver!) 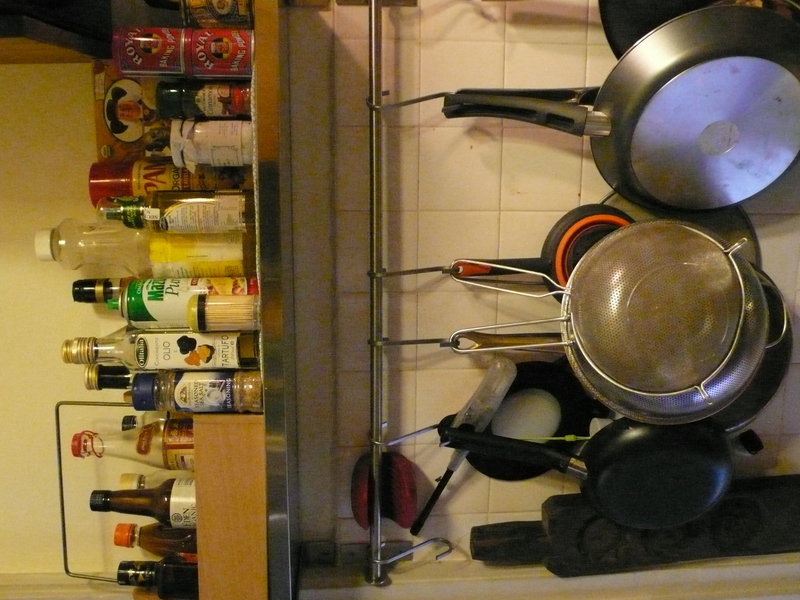 are my most used pans, and my oils and seasonings – sesame, truffle, and varied olive oils, canola, red wine, apple cider, and white vinegar, balsamico, soy sauce, vegetarian oyster sauce. Mmmmmmmm. Delicious! All in all, a compact and slightly (okay, very) messy space. But it works for me, and its efficient. 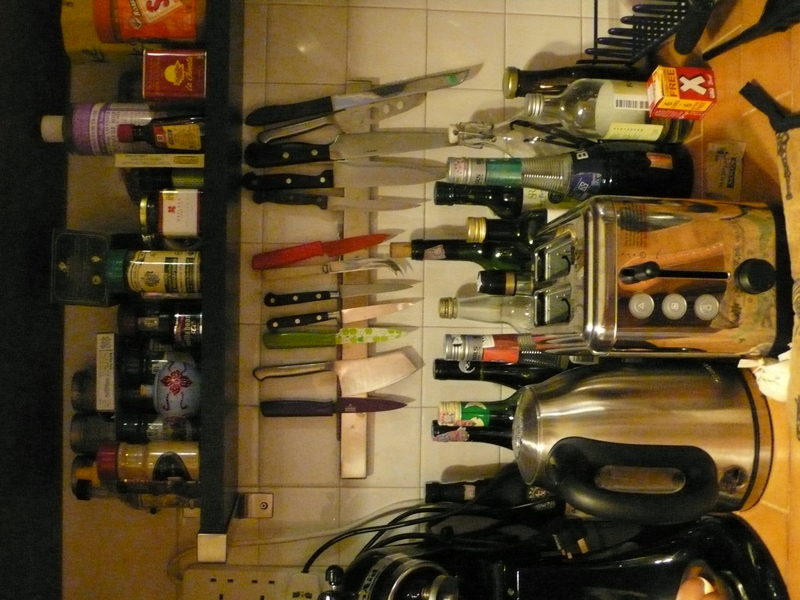 I would love a bigger place, but until then, this is my solace and my joy – my very own kitchen! I luv ur sharing, babe 😀 Thanks.. Keep up ur great sharing…. Thank you Goddesswoman 🙂 I loving it too … I was 35 before I actually had a kitchen that belonged completely to me, and its an empowering feeling.